The tap-to-click ability is enabled by default on most PC laptops, while on the Mac side of things it’s usually disabled by default. For the unfamiliar, tap-to-click means that a single tap or touch on the MacBook trackpad or Magic Trackpad is registered as a click, thereby preventing the need to actually press down the trackpad to click on a screen item. Many users really like the touch-tap feature for it’s ease and low intensity, but it’s certainly not everyones cup of tea and others users find it annoying. Because it’s turned off by default in Mac OS X, you’ll need to adjust the setting manually, which we’ll show you how to do easily through System Preferences. The feature works on most trackpads built into relatively new MacBook Pro and Air models, including any with multitouch support. The setting takes effect immediately system wide, there is no need to relaunch any apps or restart the Mac. You can immediately test the setting out by moving the cursor over anything, then simply touch tapping on the trackpad (rather than pressing) to click. By default this will also enable the touch-to-click setting for the system-wide secondary click, which is done with two fingers rather than one, or by setting a literal right-click on the lower right portion of the trackpad to to be a tap target instead. If you know of any other tricks, commands, or methods involved with enabling tap-to-click on the Mac Magic Trackpad or Apple Magic Mouse, then share them with us in the comments! Where is the more through, terminal method? I’m not sure if it works, but people say it does. Whoops, inadvertently was edited out. Working to fix that! 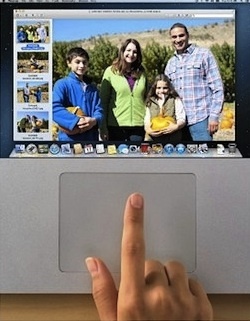 The headline says “… for All Mac Trackpads”. Not mine. I have an older Macbook Pro, and even though I’m running 10.9.1 the System Preferences >> Trackpad looks very different from what is shown here. I’m sure that’s because my hardware doesn’t support Tap-to-Click. Not a big deal, but please correct the headline to say “… for RECENT Mac Trackpads”. What model year is your MacBook Pro? This should be stated as all MULTITOUCH trackpads, you’re right. touch-tap feature for it’s ease – its. OSX Daily seems to not understand the difference between “it’s” and “its”. It is really quite simple. Anyway, thanks again, it’s appreciated! Though this says it will take effect system wide it does not work on my login screen. It does not work on my default guest account. The first one I don’t see any way of fixing this, the guest account has to be manually set each time I log in to it (since it resets at log out). Is there a way to do this *truly* system wide? my trackpad secondary click isn’t working at all so there is no way for me to even select the tap to click feature. is there another way I can select this feature? possibly with a shortcut? How do you select ‘tap to click’ ?? Yes how do you select the tap to click, with keyboard ??? same problem like above :( I cant click any thing. Waste of time. Can’t click to chose. Is there any shortcut keys in which I could scroll down on “tap to click” button and tick it? Hi, Thanks a lott!! I have been struggling to find a solution to this macbook feature but never got an appropriate solution on any website. You have clarified this with such ease! Thanks again! I can’t tick the “tap to click” option, aren’t there any shortcuts with the keyboard?! Maybe it would sound crazy, but when I upgraded to HighSierra, I did not had a lot of config items considering mouse and trackpad, and my trackpad worked well but there was nowhere possible to setup trackpad “Tap to click“, though trackpad worked well the system informed me that the trackpad not found, configure bluetooth to find it…sudenly it crossed my mind that I am working without of battery, just over the electrical power. When I shutted down my MacBook Pro and inserted the battery, started Sierra and suddenly I had all the necessary config. fields considering mouse and trapped. This is grReat.It actually works! My other nct members will be thrilled to see this. 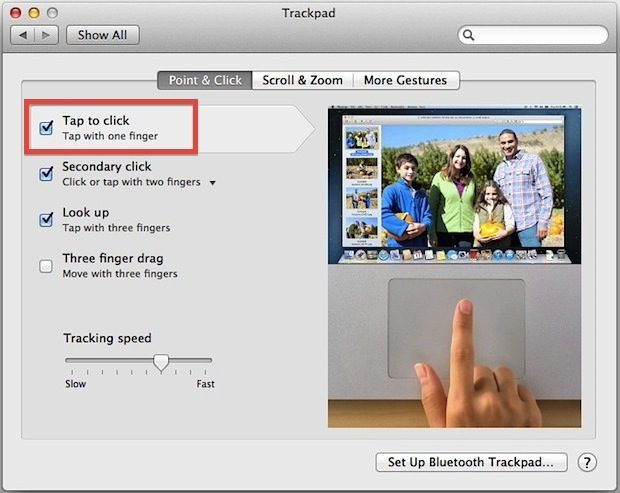 On OS X 10.9 there are no separate trackpad settings and there is no “tap to click” setting that I can find. Your answer is absurd. The entire point of this question is to find out how to “click” meaning SELECT a menu item without using the mouse. The USUAL cause for such a request is that the mouse is not functioning or in the case of MANY of us, the tap to click has been turned off and we can NO LONGER select that very attribute to turn it back on! I am so tired of useless information written by people who think that they actually are helping others when instead they waste precious time for all of us by filling with web with drivel. Try this support article to click without mouse/broken trackpad physical click… awkward. Worked. Remember to undo otherwise you can’t type after you get click-tapping going. Seems like the writer hasn’t encountered this problem. This has never happened to me until this past year or so and it has happened a few times now–always when working in premiere pro. When the mouse stops “clicking” it is some sort of crash. The mouse works but NONE of the menu items (including the red, yellow, green circles on a chrome menu bar) highlight when you scroll over them. No change. It’s as though the mouse only serves to move an arrow around your screen. This cannot be caused by another bluetooth connection or anything like that. It’s a bug. So far, I only know how to get it back with a restart. Shift command U will open Utilities. T will highlight terminal or an app near terminal. You can also just down arrow to get there. command O to open it. it’ll reboot your machine the right way instead of having to just hold the power button down. I figured it out!!!! command option f5 to open accesibility options , press tab to move down to enable mouse keys and press space, hover mouse over done and press letter i, hover over tap to click and press i to click. to remove mouse keys press and hold command option f5 , tab down to enable mouse keys and press i..